This barn dance was not the kind of barn dance you might be thinking about. There was no hay or livestock on the property, although there was Def Leppard’s “Animal” on the karaoke machine. This barn is not a working barn any more. In fact, you might it a party barn. It sits in the middle of town right next to a new subdivision, and people can rent it for parties and weddings. When we’re visiting my dad, we have often seen a bridal party taking photographs at the barn. This weekend it was our turn to party at the barn. The theme? Dress up in either 60’s or 80’s garb. One of my cousins planned a birthday party for my aunt and my cousin, who both have milestone birthdays this summer. The first day of summer in Iowa was a typical Iowa summer day; hot and humid. 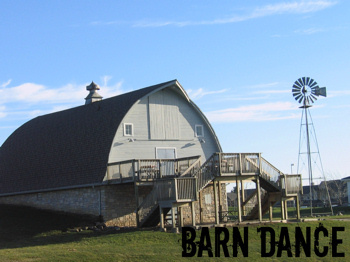 Despite its suburban location, the barn is a real barn. Which means there was no air conditioning, just two huge industrial fans, one blowing in one barn door and the other blowing air out of the other. Lily and Emmy had come to dance, however, and so dance we did. 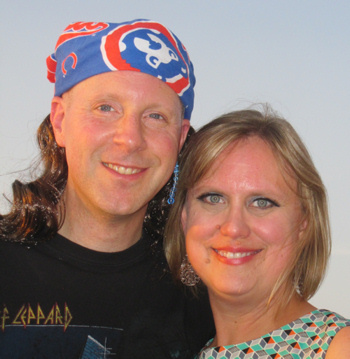 The girls were dressed up in 80’s garb, and Ed had purchased a special mullet for the occasion. We prepared by singing and dancing to “Girls Just Wanna Have Fun” and “Walk Like an Egyptian.” Emmy had a special request for the DJ, however, for a dance that is definitely not retro…yet. Her request? Op, op op op oppan Gangnam Style! The girls also got a taste of the original Nintendo. My cousin projected Super Mario Bros onto a screen and it didn’t take long for Lily and Emmy to get hooked! Is that a good thing or a bad thing? They are so used to a touch screen that it took them a few minutes to adjust to the game controller, but then they had a blast! After we worked up a sweat (which really didn’t take much more than toe tapping) and sang our hearts out into the microphone (Ed and I do a mean Def Leppard impression), the barn dance was over and it was time to take the girls off to bed. YES!!! This is awesome! 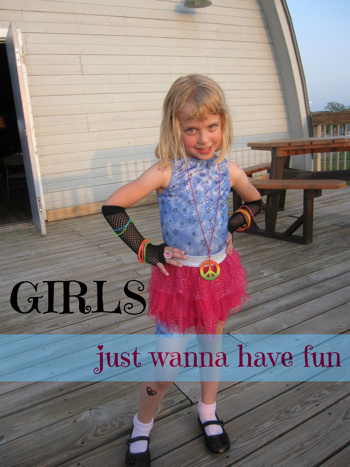 My sister and I had a ridiculous amount of jelly bracelets when we were kids in the 80s. We also had these awesome sweatshirt dresses with colored handprints (not ours) all over, worn belted, and with leg warmers and I side ponytail of course. And if I could get myself a "vintage" (gag me…am I that old?!) Super Mario Brothers game/system I would literally abandon my kids for at least a week while I played it. I've never been to a barn dance before. That sounds like a lot of fun! My son started out with the original Nintendo and still has it (plus every other game console he had in between). You guys look awesome! What a fun party. I can't imagine my kids playing the old Nintendo vs. the new video games. They have never tried either yet so maybe I should start them on the old stuff! As in, blowing into the machine and cartridges to get them to work! My recent post This is Big Time, Baby. We had so much fun! If only it hadn't been so hot, but that's how it goes!